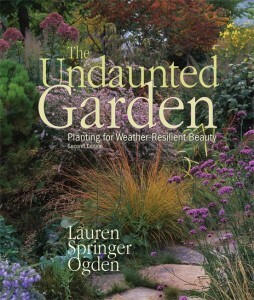 Join the Gardens this Thursday (April 14) at 7 p.m. for a very special evening with acclaimed garden designer and author Lauren Springer Ogden as we celebrate the publication of an all-new edition of her best-selling book, The Undaunted Garden. In this original lecture, Lauren will talk about the various planting styles she has experimented with in her three Colorado gardens; highlight some of the plant stars; and weave a discussion of sustainability in gardening throughout. The program will include time for discussion as well as a book sale and signing. Don't miss this unique event and your chance to get a signed copy of one of the best garden books of the century! Register online or call 720-865-3580.